Dr Peter Poulos uses beautiful, tooth coloured material for dental restorations (fillings). There are many reasons for choosing these types of restorations, including concerns with the use of mercury in older style amalgam fillings, and of course the far superior cosmetic result. Can Tooth Coloured Fillings Repair Back Teeth? Back teeth that need restorations can now be completely rebuilt with the latest tooth coloured material. This new treatment will completely restore teeth to a beautiful condition. 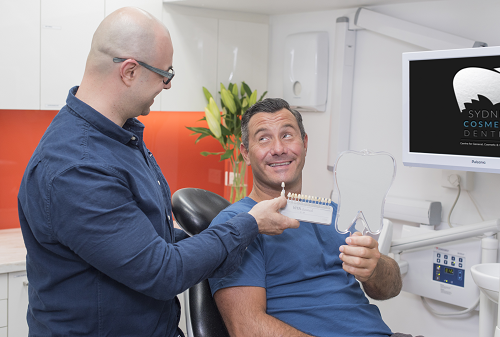 Dr Peter Poulos utilises perfectly colour matched tooth coloured restorations, so that your back teeth can be rebuilt with a much better cosmetic result. Can I Replace Older Amalgams with Tooth Coloured Fillings? If your teeth are filled with older amalgam fillings, the tooth enamel could be at a high risk of fracturing. These teeth can now also be restored with tooth coloured restorations, preserving the remaining healthy tooth structure. After treatment by Dr Peter Poulos, you can be sure that you will be laughing and smiling again.